Lie on the beach this summer and your body will be bombarded by about sextillion photons of light per second. 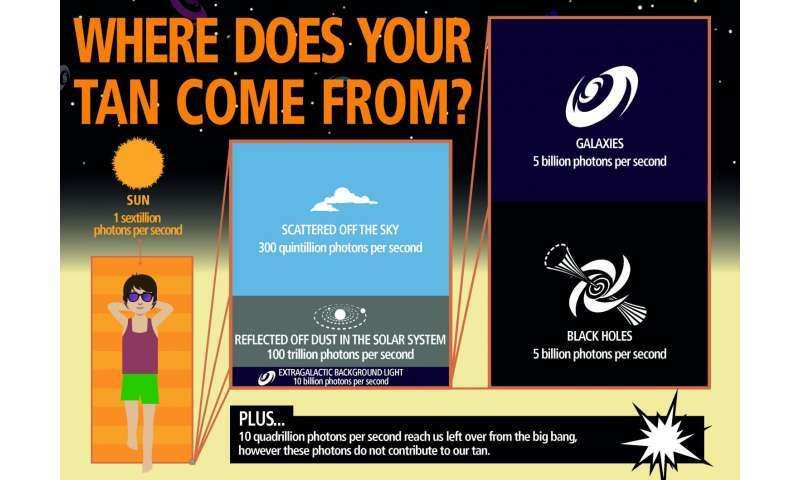 Most of these photons, or small packets of energy, originate from the Sun but a very small fraction have travelled across the Universe for billions of years before ending their existence when they collide with your skin. In a new study to be published in the Astrophysical Journal on August 12th, astronomers have accurately measured the light hitting the Earth from outside our galaxy over a very broad wavelength range. International Centre for Radio Astronomy Research (ICRAR) astrophysicist Professor Simon Driver, who led the study, said we are constantly bombarded by about 10 billion photons per second from intergalactic space when we're outside, day and night. "Most of the photons of light hitting us originate from the Sun, whether directly, scattered by the sky, or reflected off dust in the Solar System," he said. "However, we're also bathed in radiation from beyond our galaxy, called the extra-galactic background light. These photons are minted in the cores of stars in distant galaxies, and from matter as it spirals into supermassive black holes." He and collaborators from Arizona State University and Cardiff University collated observations from NASA's Galaxy Evolution Explorer and Wide-field Infrared Survey Explorer telescopes, the Spitzer and Hubble space telescopes, the European Space Agency's Herschel space observatory and Australia's Galaxy And Mass Assembly survey to make the most accurate measurements ever of the extra-galactic background light. "The galaxies themselves provide us with a natural suntan lotion with an SPF of about two," he said. The study is part of ICRAR's ongoing work to understand the evolution of energy, mass and structure in the Universe. "The processes which shape and shuffle mass generate vast quantities of energy, dwarfed only by the vastness of space," Professor Driver said. "The precise physics as to how this energy is released is still not fully understood and work continues to build numerical models capable of explaining the energy that we've now measured." The research will be published in The Astrophysical Journal on August 12th. More information: 'Measurements of Extragalactic Background Light from the FAR-UV to the FAR-IR from Deep Ground and Space based galaxy counts,' published in in the Astrophysical Journal on August 12th, 2016. "Lie on the beach this summer and your body will be bombarded by about sextillion photons of light per second." Hmm.. new pickup line when you see that bronzed blond at the beach..... "Your tan is out of this galaxy"
"Astronomers have accurately measured the light hitting the Earth ... so there is ..immediate need for alarm." How are measured? There is no light between the Sun and Earth. What are measured, space is dark, the complete absence of light? "The sun light must have obviously been changing its nature on its way from the Sun to our planet. It is visible on Sun and on Earth, but not between these two objects." Although hysterically funny, this statement clearly demonstrates COMPETE lack of understanding of physics, so how the author feels justified in sharing his ignorant musings is beyond understanding. Sorry was laughing too hard. That should have read " .....demonstrates COMPLETE lack of understanding of physics...."
I agree it is funny that you are not look first minimum evidence and obvious data. Outside the atmosphere is totally dark, you can see the footage station ISS and so on. You say you and they transformation, eh that's ridiculous. What law supports transformation (stupidity or naivety or blindness)? Always refer to the offered link, then make a comment. In "WD" (http://www.svemir...niverse) have the pictures, immediately after introduction. You clearly do not understand how to relate what you *see* to the physics of light. Either the light travels directly into your eye - such as happens when you look directly at the source - OR the light must be redirected into your eye by something else by reflection (i.e. you can see the object). Given that the space between the Sun and Earth is virtually empty, there is nothing to reflect the light and it continues until it reaches something to reflect from (or your eye). The light is NOT "transformed" as your reference suggests. If I understand correctly, there is light only if there is matter and something that collides with matter (that might be refuse)? Not refuses to the light, because between the moon and Earth is also dark. Maybe you think it's dark = light? The light there is only and only if there is a collision of waves (radiation) with visible matter. There is not another and different example or evidence. Sorry, but you are again making no sense. I have explained that light can be SCATTERED OR REFLECTED from "matter". But it clearly exists without the pre-existence of such matter. I again remind you that the space between the Earth and the Moon is devoid of matter to reflect the light, one therefore sees nothing there. This does not mean the "space is dark"; You would still be able to see Earth, Moon and Sun were you there. Not important sense (for you) already evidence. The light there at the beginning (Sun which emits radiation and has a substance) and in the end where the radiation encountered with matter (space bodies, gas ..) as well as in a microwave oven (only waves and matter without jumping and rebound). You without evidence talking about transformation and rejection of, the light in the eye (instruments are not eye but confirm that the universe or space dark). Thanks for the heads-up. I had not realized the ideas he was expounding were his own. I am just beginning to realize that he and reason are complete strangers to eachother. I would not have used such a harsh tone in my critisism of these ideas had I known you were the author. So, apologies for that, although I stand by everything I said: You are making NO sense. In general, react in the same tone as is directed to me. In discussions on the portals have 1-2000 comments, over 100,000 visits, it is acquired reflex. Sory. Each offered links (articles are my) has in itself links to other pages (up the first link 10, the second five, etc.). When reading offered, articletake you this as a different view of the official, because my main goal is to bring order in view of the Universe, to point out the inconsistency hypothesis beside the obvious evidence. 2004 to the present day completely attitudes contrast are mostly accepted (truth illegally). Name says enough that exclusively in work I use existing and proven data. My intervention is a different view (agreement) of evidence and creating universality (avoiding regular occurrence that the same evidence today means one thing tomorrow another). The picture in the article "Are we blind or we do not want to see the dark matter!" http://www.svemir...tml#17b, is enough to reassure unfaithful Tome on this matter (light). Just think, somewhere right now some lifeform in another solar system might be tanning off my sun. They could at least pay for it. You wouldn't download a car! Stop solar piracy.